1. 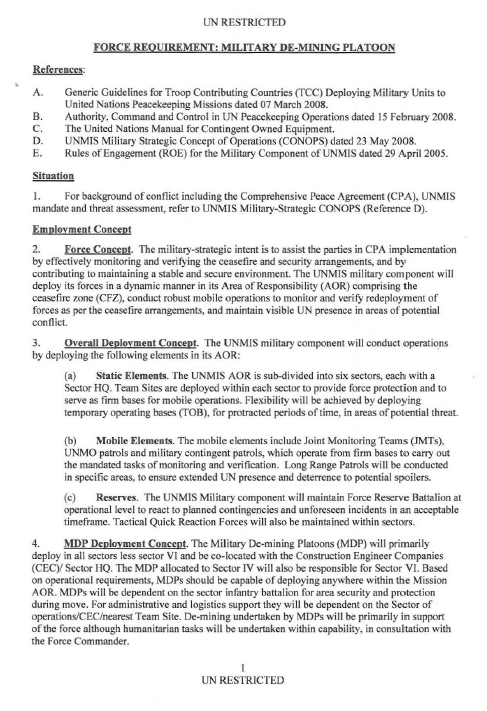 For background of conflict including the Comprehensive Peace Agreement (CPA), UNMIS mandate and threat assessment, refer to UNMIS Military-Strategic CONOPS (Reference D). 2. Force Concept. The military-strategic intent is to assist the parties in CPA implementation by effectively monitoring and verifying the ceasefire and security arrangements, and by contributing to maintaining a stable and secure environment. The UNMIS military component will deploy its forces in a dynamic manner in its Area of Responsibility (AOR) comprising the ceasefire zone (CFZ), conduct robust mobile operations to monitor and verify redeployment of forces as per the ceasefire arrangements, and maintain visible UN presence in areas of potential conflict. (a) Static Elements. 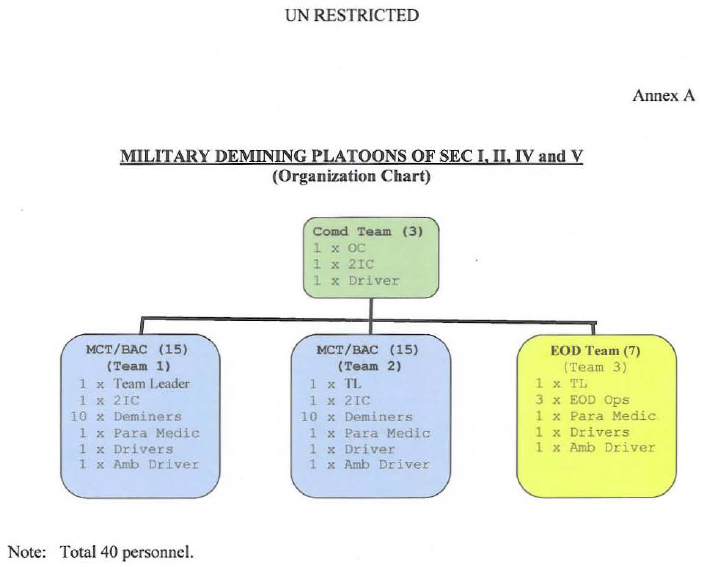 The UNMIS AOR is sub-divided into six sectors, each with a Sector HQ. Team Sites are deployed within each sector to provide force protection and to serve as firm bases for mobile operations. Flexibility will be achieved by deploying temporary operating bases (TOB), for protracted periods of time, in areas of potential threat. (b) Mobile Elements. The mobile elements include Joint Monitoring Teams (JMTs), UNMO patrols and military contingent patrols, which operate from firm bases to carry out the mandated tasks of monitoring and verification. Long Range Patrols will be conducted in specific areas, to ensure extended UN presence and deterrence to potential spoilers. (c) Reserves. The UNMIS Military component will maintain Force Reserve Battalion at operational level to react to planned contingencies and unforeseen incidents in an acceptable timeframe. Tactical Quick Reaction Forces will also be maintained within sectors. 4. MDP Deployment Concept. The Military De-mining Platoons (MDP) will primarily deploy in all sectors less sector VI and be co-located with the Construction Engineer Companies (CECY Sector HQ. The MOP allocated to Sector IV will also be responsible for Sector VI. Based on operational requirements, MOPs should be capable of deploying anywhere within the Mission AOR. MOPs will be dependent on the sector infantry battalion for area security and protection during move. For administrative and logistics support they will be dependent on the Sector of operations/CEC/nearest Tcam Site. De-mining undertaken by MOPs will be primarily in support of the force although humanitarian tasks will be undertaken within capability, in consultation with the Force Commander.